Every teacher knows that summer really doesn’t mean that things slow down when it comes to brainstorming, learning, gathering ideas for lessons, and professional growth. Before we know it, the school year has started and we’re getting to know new staff, students, and setting goals for ourselves for the new year. This summer has been one of those summers that has flown by for me due to awesome professional development opportunities, weddings, and prepping for the middle school entering the 1:1 iPad pilot (our district is now 1:1, first through fifth grade). I’m happy to report that the iPads have been deployed, MAP testing is over for the fall, and I’m now having time to reflect on what a whirlwind it has been! So, here come a few posts that I’ve been brainstorming all the while. This summer, I had the opportunity to participate in the Summer Institute in Digital Literacy at the University of Rhode Island. I was in the company of technology educators, advocates, classroom teachers, library specialists, higher education instructors and professors, and journalists. Our goal was to dig into what digital literacy is and how we can support our students in becoming more literate. Hearing from others in different areas of the field of education and from the media field helped me to see that “text” can be anything. We read images, billboards, search results, videos, infographics, printed literature, app settings, etc. While the process in which we read, interpret, and analyze those different forms of text may be slightly different, we are still pulling meaning from and comprehending each of them. This seems like such a basic idea, but it was one of the first times that I really had actual time to process this. While at the institute, I had the opportunity to present a session with a Michigan State colleague, Bill Marsland. Resources from our presentation, “Catch You On the Flip Side: How Educators can Explore Digital Literacy Through Flipped Professional Development” can be found here. Another twist on the conference was that we all participated in an inquiry based action project. My partner, Jeremy Hyler, and I took the time to explore grammar education in the 21st century. How could we take grammar practice and make it more motivating and meaningful for our students? This exploration is one that I have researched before with my MAET coursework. Grammar instruction is typically static, rote practice. Yes, we put a rubric with graded assignments that focuses on the application of these concepts and rules, but is the connection really there for students? Jeremy and I determined a structure that would allow for an inquiry approach to grammar instruction utilizing blended learning. This approach calls for student ownership and allows students to analyze how text is compared across mediums. Step 1. 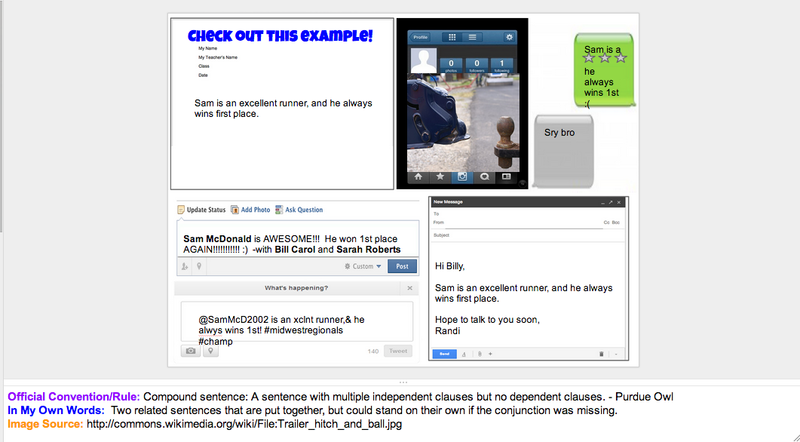 Students view a “teaser” video that has an example of a grammar concept/rule in it and some examples and non examples of the concept/rule which can be found in current text they are reading. Step 2: Students are given resources to access to try and figure out what the concept/rule is. Step 3: Students update their grammar portfolio, or what we referred to as their “Grammar Smackdown”, which has been created in Google Presentations. Here, they must determine how this concept/rule looks in different mediums. Also, they will utilize the speaker notes within Google Presentations to cite their sources and to put the ideas into their own words (seen below). By going through this process, it challenges students to think about the differences between formal and informal communication. It reinforces the idea of how images can represent an idea, how we should be responsible digital citizens and cite our sources, and how we communicate with different audiences. They first take the concept/rule and input an example into the template for the research paper, they can see what is appropriate in academic writing. By taking that same concept/rule and plugging it into the template to fake Tweet, Facebook post, Instagram post, text message, and email, they are then able to see patterns and differences that arise when writing in these different contexts. It allows them to see what language looks like in the 21st century, across platforms. Hopefully, inspiring them to write for the correct audience and purpose in future circumstances! CCSS.ELA-Literacy.CCRA.L.1 Demonstrate command of the conventions of standard English grammar and usage when writing or speaking. CCSS.ELA-Literacy.CCRA.L.3 Apply knowledge of language to understand how language functions in different contexts, to make effective choices for meaning or style, and to comprehend more fully when reading or listening. Summer Reflections…in the Fall by Candace Marcotte is licensed under a Creative Commons Attribution-NonCommercial-ShareAlike 3.0 Unported License. Categories: Reflections&Ideas | Tags: CCSS, digital.literacy, grammar, pd, presentations | Permalink.